Today almost 20 years after this essay, not only the sky over Berlin’s Mitte district has disappeared, but also that over almost the entire downtown. Broad expanses of the formerly open urban fabric once again feature narrow corridors, the streets of the Wilhelmine Reich with its closed tenement blocks, and taking the example of the new City Palace, among others, one can rightly wonder whether another kind of city might not have been possible, if not indeed desirable. Roger Bundschuh is a Berlin-based architect, who like many of his colleagues has repeatedly addressed the traditional Berlin block structure and used architecture with his typical openings and views to try and break through the closed urban fabric of this tenement city. Arguably his most famous project, the residential and commercial building L40 on Rosa Luxemburg Platz, is a large, dark grey example of how such a block can be structured differently and more openly simply by refusing to fully exploit the available site. 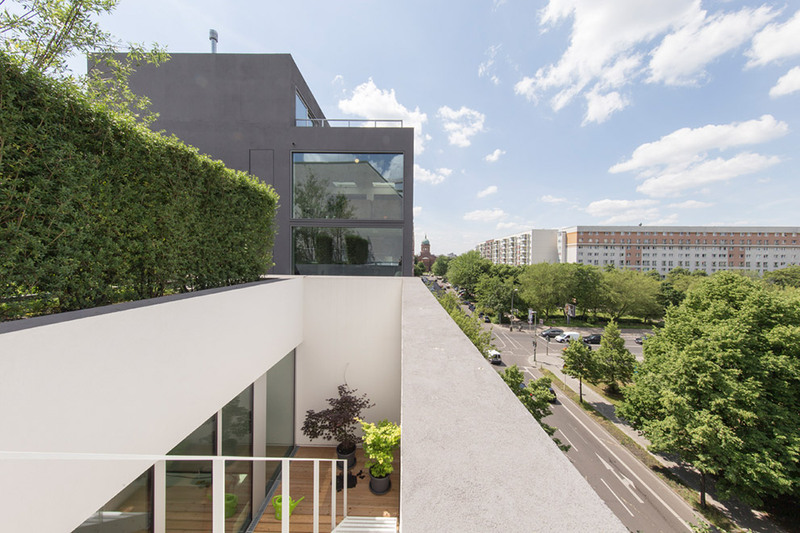 Now, pretty much on the border between Kreuzberg and Mitte, in Michaelkirchstrasse, opposite the massive power plant Mitte, he has completed a small house that approaches the same them on a smaller scale and manages to claw back at least part of the sky over Berlin. The block in which Bundschuh's new building stands is one of these fragmented line for which Berlin was long known. Facing the Spree a small set of trailers has toughed it out on overgrown wasteland, while lining Michaelkirchstrasse are a few unimportant or tasteless buildings of the 1990s and Noughties. Unbuilt gaps as potential land for development can still be found in-between, until at the intersection with Köpenicker Strasse, just a few meters away from the Deutsches Architekturzentrum, the unruly ensemble climaxes in a few garages and the “Wurstpaten” diner. Now directly next to the diner, stands the firewall of Bundschuh’s new building, towering up like a dark grey plastered version of Half Dome in California. The diner is somehow almost threatened by it. Not because there is a danger of avalanches, but because this wall creates a connection, which prompts the question of when the block frontage is likely to be complete. Roger Bundschuh describes his project simply as a “multi-family dwelling”, but actually there are two houses. Looked at from the front: the client and his wife live in the house on the left: an art collector, who has fulfilled his dream of a downtown house with roof garden. In the house on the right there is a store, and above it five compact, owner-occupied apartments, with the penthouse flat straddling two floors and boasting a small roof terrace. As both buildings share strikingly large windows and a ventilation system concealed for some reason in the facade, not to mention the rather coarsely applied plaster, both buildings appear initially to form a single unit, even though they are placed as far apart as possible on the small plot. They snuggle up to their neighbors, the new build on the left, and the imaginary one on the right, which you could now see as the new corner of the block in place of the diner. An unusual urban space has been created between the two new buildings. This space, which in its paving work amounts to an extension to the sidewalk, runs up to a freestanding access tower. The latter comprises an elevator shaft of fair-faced concrete panels; between the tower and the two houses small gaps remain in which the open metal staircase behind the former is visible. Short bridges lead to the front doors: anyone entering an apartment can briefly be seen here. 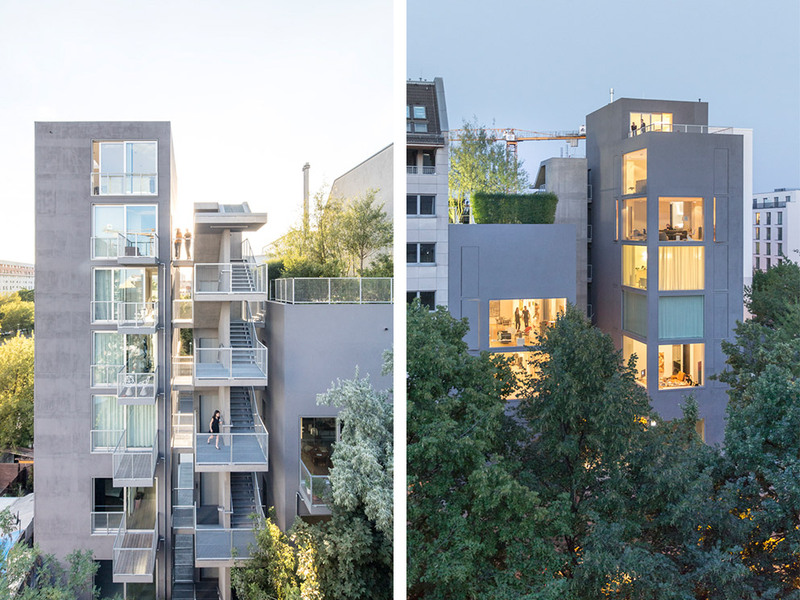 Thanks to the gap between them, both buildings have three window facades, which creates a sense of great openness inside the apartments. 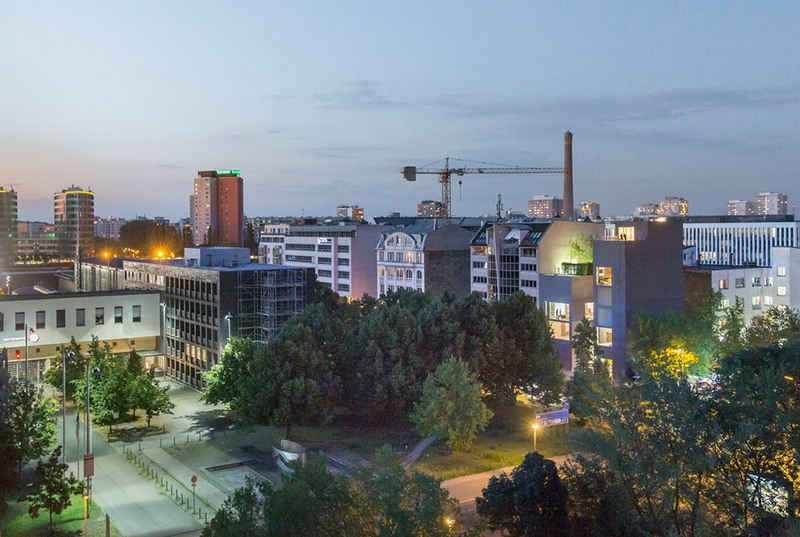 Thanks to the outsized, room-to-ceiling windows, Bundschuh indulges in numerous experiments with every conceivable view between the apartments, houses and the city. The living space seemingly merges with its surroundings, particularly on the lower floors the sheer scale of vistas and sky is impressive. The existence of the large windows creates a situation in which both houses watch each other, resulting in a permanent oscillation between private and public, withdrawal and exposure. Presumably, this oscillation will largely involve using long curtains: If they are open, so is the living space; once they are closed intimacy and coziness arise, albeit in a space that also feels smaller. 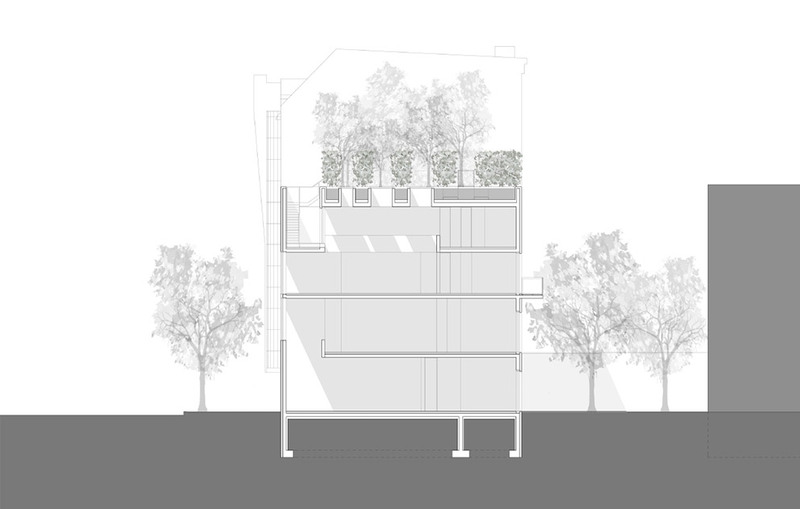 Each apartment has its own small balcony facing the rear, where beneath a large firewall there is a modest, communal garden. And as the apartment layouts are emphatically open – open plan one-room apartments structured by the interior service core with bathroom and kitchen fittings – a complex multitude of vistas and connections between living and urban spaces is created in a very small area. Bundschuh explains the aim in the client’s house, was to unite all the qualities of a suburban house. On the 80 m² ground plan the open floors appear spacious; openings and small galleries allow light to fall vertically through the different levels – also a motif Bundschuh employed in L40. It is the vertical exhibition light we are familiar with from museums or good galleries, that here in this private setting seems both unusual and highly luxurious to us. But after all the occupant is an art collector who can use several of his walls as perfect exhibition surfaces. 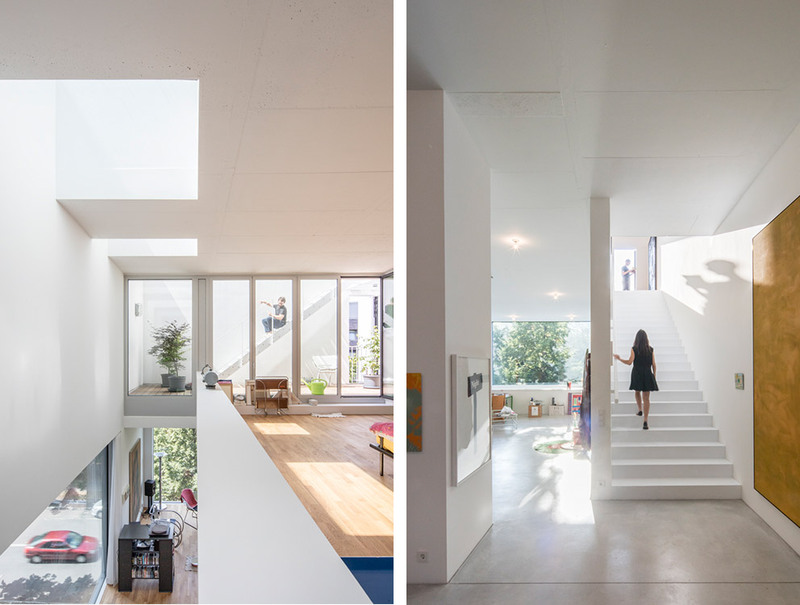 The ground floor, whose large, panoramic window faces the small square between the two houses, serves as a semi-public exhibition space. And the square on which a sculpture by Birgit Werres already stands, is to become an exhibition area. Though freely accessible, it takes a little effort to enter this private looking space between the houses and elevator shaft. Above the ground-floor exhibition room, the subsequent rooms are graded according to privacy, the floor with the study, followed by a living and kitchen area, and finally a bedroom with bathroom. 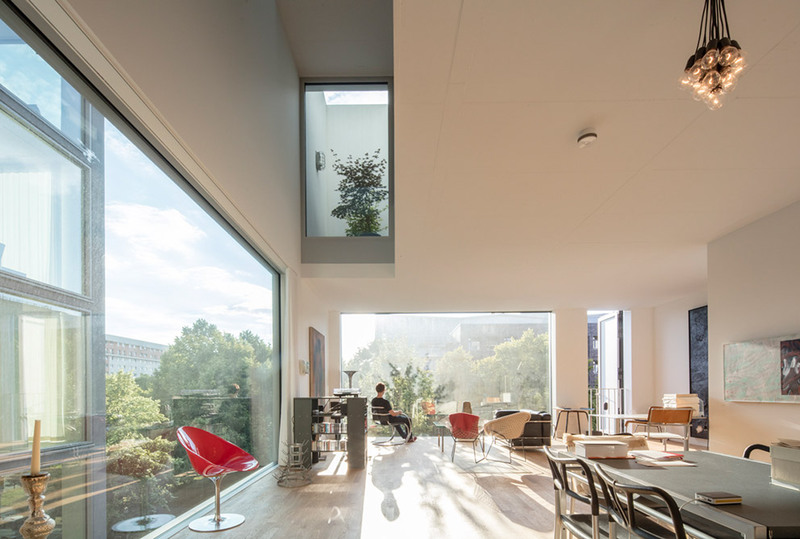 Before the bedroom is a small patio from which a narrow, white staircase – almost Japanese – leads to the roof terrace. The owner had indicated to the architect that he wanted to be able to enter the garden directly from the bedroom. So as not to be obliged to place the bedroom to the ground floor, Bundschuh moved the garden to the roof. Alongside several hedges and small grassed areas there are seven young willow trees, whose branches form a protective roof over the house and skylights, through which you can look from the bedroom into the starry sky. The house is definitely not without a certain German romanticism. So not only for the occupants of the private apartments has a fairly large piece of sky over Berlin been preserved, but a certain openness has also been retained in urban space; at any rate, if you appreciate the view from the street into the courtyard in this typical Berlin urban landscape with its spontaneous vegetation, high brick wall, and even a few original sections of the Berlin Wall that are on the plot, and which nobody seems interested in any longer. Apparently, people are so enamoured with the present in Berlin they find it difficult to muster appreciation for even the most recent past. 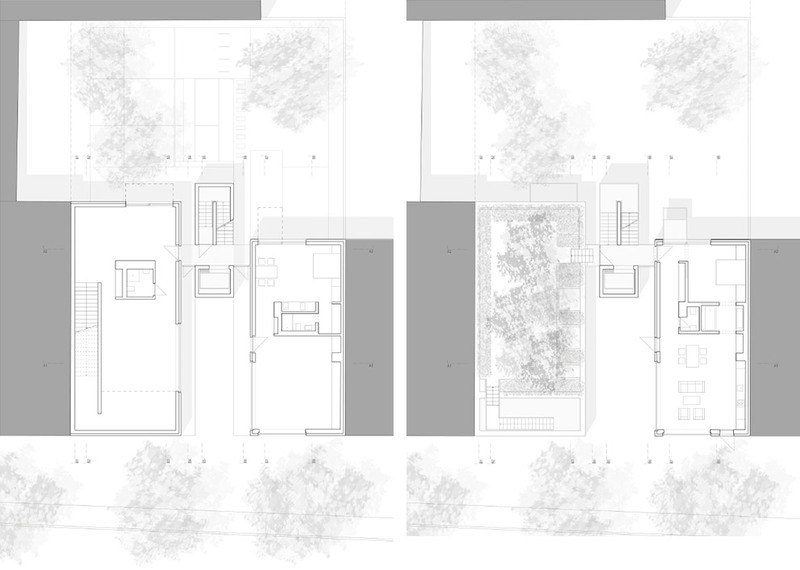 Longitudinal section: The many openings in the building and the private garden on the roof create a complex spatial configuration in what is a relatively small house.